Chicago is known for football, deep dish pizza, shopping, and the Sears Tower; sadly, it's not yet known for great racing. However, there was at least one driver who didn't sleep through the Chicagoland snoozefest; that would be Tony Stewart, who celebrated the end of his 20-race winless drought with another climb up the fence. Smoke was left awake and alert after a weekend where he got a lecture from the coach about playing nice with others, and he turned that motivation into victory celebration come Sunday night. 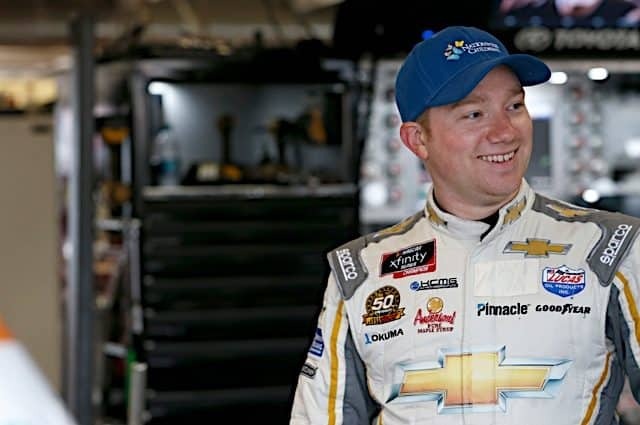 Smoke wasn't the only happy camper; Richard Childress Racing put all three of its drivers in the Top 10, while polesitter Casey Mears led the way for Hendrick Motorsports. But there were plenty of sour faces at the end of the day, too. 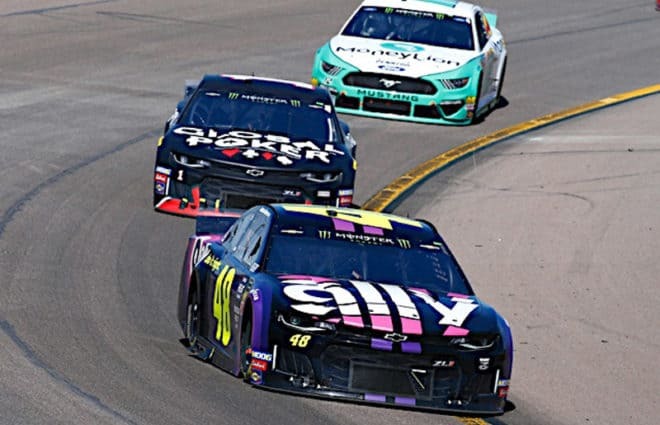 Jimmie Johnson saw his chance at victory blow up along with his tire with 45 laps to go, and Dale Earnhardt, Jr. had to muscle home his Chevy to a 19th place finish with no power steering. So,what mood did _your_ favorite driver leave off heading towards the final off week of the season? Read this week's Who's Hot and Who's Not to find out if he made the cut. *1st* Fence climb after a Cup victory in 2007 for Tony Stewart on Sunday. *1.727* Tony Stewart's margin of victory over Matt Kenseth at Chicagoland. (in seconds) *2 hours, 58 minutes, 59 seconds* Time it took to complete the USG Sheetrock 400. *3* Career Cup poles for Casey Mears in 163 starts. _With a little luck, we can help it out._ _We can make this whole damn thing work out._ _With a little love, we can lay it down._ _Can't you feel the town exploding?_ _There is no end to what we can do together._ _Paul McCartney_ If you're asked to describe Tony Stewart's year in just one word, chances are "lucky" won't be the one that makes the final cut. Lots of other adjectives take precedence instead: temperamental, unpredictable, controversial, underachieving. But after going through a roller coaster first half of a season in which not three, not four, but five races Stewart could have won slipped right through his grasp - with nothing but unforeseen circumstances to blame - it's clear that luck's been the last thing to come to his aid. Not anymore. *The Key Moment*: Matt Kenseth got a good run on Tony Stewart with 38 laps to go, but Stewart held off the challenge...it was clear sailing for the No. 20 after that. *In a Nutshell*: McRacing at McTrack. Perhaps the worst damn race of the season. *Dramatic Moment*: Honestly, I simply don't recall any. I guess the race was less boring in the first few laps after a restart. With passing at a premium, some drivers took insane chances. *What They'll Be Talking About Around the Water Cooler This Week*: Before we get started on the race, *I need to take a personal moment to thank all of you who emailed me your condolences or offered your prayers for my family in the wake of my Mom's passing on July 7th*. *1. They call it "cookie cutter" for a reason* - Sorry guys, but that just wasn't a very exciting race. Stewart got out front with a fuel-only pit stop and was never challenged in the closing laps after holding off a single pass attempt by Kenseth. There were several long green flag runs and not a lot of lead changes, unless you count the ones achieved through pit cycles, and most of the attrition was due to single car incidents. The only good news to report: the race didn't last that long. *2. 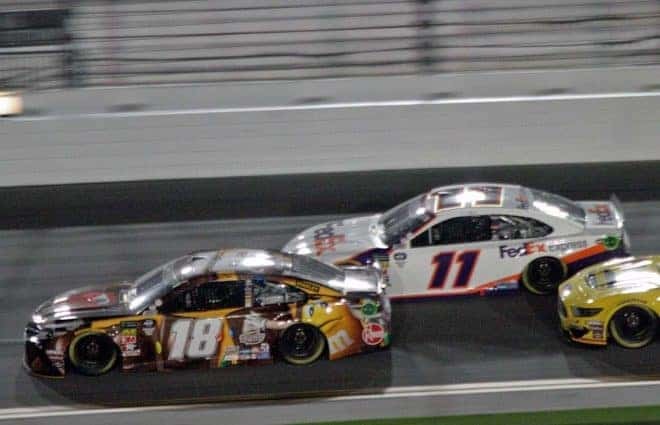 He took the words right outta my mouth* - Tony Stewart said that team owner Joe Gibbs had to break away from his vacation to referee the feud between Stewart and teammate Denny Hamlin. Tony described it as Gibbs "coming to babysit his two kids." Hey, that's just what I was thinking. 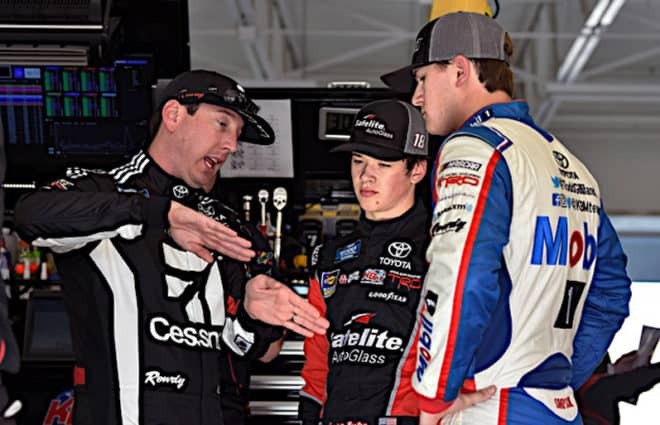 Of course, Stewart is ten years older than Hamlin and, as the senior driver at JGR, shouldn't really need a babysitter - should he? But wouldn't you have loved to be a fly on the wall in that meeting? Like always, Tony's keeping it interesting. With the Daytona debacle now in the rearview mirror, the battle for the Top 35 in car owner points continued this week in Chicagoland; but after an uneventful day for the majority of the cars on the bubble, little changed as far as positions go. In fact, the gap between 35th and 36th place is now the widest the margin has been all season long. 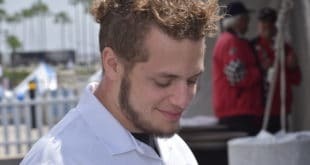 For more on what happened with those teams on the bubble this weekend at Chicagoland, as well as an update on the potential changes to the Top 35 rule next season, check out this week's edition of the Bubble Breakdown: *Biggest Mover(s)* The Wood Brothers decision to put *Bill Elliott* in the No. 21 car in an effort to propel the team into the Top 35 in owner points has paid dividends so far. 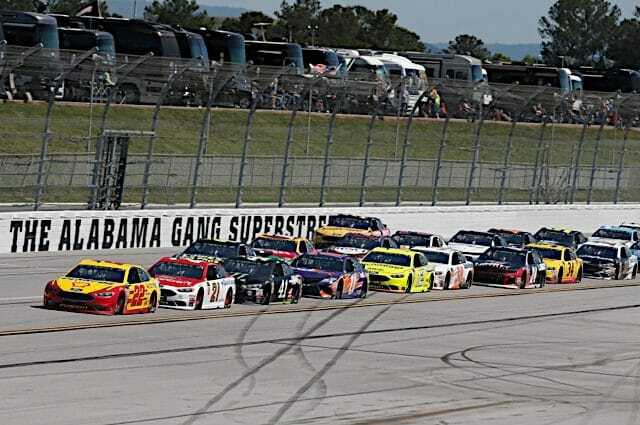 *Rookies in the Starting Lineup*: Paul Menard (16th), David Reutimann (21st), Juan Pablo Montoya (30th), David Ragan (32nd) *Unofficial Finishing Positions*: Juan Pablo Montoya (15th), David Ragan (25th), Paul Menard (42nd), David Reutimann (43rd) *Rookie of the Race*: *Juan Pablo Montoya*. After starting 30th for Sunday's USG Sheetrock 400, Montoya used the first 60 green flag laps to guide his Wrigley's Big Red Dodge into the Top 20. 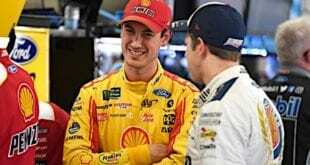 Crew chief Donnie Wingo and the team did not appear to figure out the setup needed to run with the leaders, though, as Montoya would eventually lose a lap during the race's second green flag stretch. *In a Nutshell:* Buschwhacking Cup regulars dominated the USG Durock 300, leading all but four laps of the race and taking nine of the Top 10 finishing positions. Denny Hamlin was strong early in the event, but a problem getting onto pit road and a dead battery knocked him from contention. 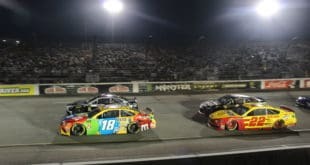 Kyle Busch dominated the second half of the race until the caution flag flew for a spin by Aric Armirola with 34 laps to go. Busch's team made a decision to come to pit road for tires while the cars of Jeff Burton, Kevin Harvick, Matt Kenseth, and Clint Bowyer stayed out. Busch restarted the race eighth but was only able to make up three positions by race's end. Harvick took the lead with 27 laps to go and held off the charge of Kenseth over the last 10 laps to become the first repeat Busch Series winner at Chicagoland. Kenseth placed second -- crossing the line 1.012 seconds behind Harvick -- followed by Childress Racing teammates Burton and Bowyer. Busch placed fifth, with Paul Menard, Hamiln, Tony Stewart, Dave Blaney and Stephen Leicht rounding out the Top 10. 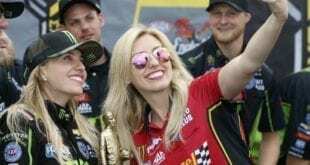 *In a Nutshell:* Mike Skinner won his fourth race of the season Saturday night in the Built Ford Tough 225 at the Kentucky Speedway. Skinner beat runner-up Travis Kvapil by 5.570 seconds. Ted Musgrave, who returned to the No. 9 after a one week suspension, finished third. Ryan Mathews and David Green rounded out the Top 5.